Nigel Calder takes the pulse of science, as the author of Magic Universe and Einstein's Universe. He checks predictions of the past half-century, to see how they worked out. And his hand is on the brow of frenzied climatology, as a co-author of The Chilling Stars: A Cosmic View of Climate Change. By taking me back to when I reported the victory of the pioneers of plate tectonics in their battle against the most eminent geophysicists of the day, it makes me feel 40 years younger. Shredding the textbooks, Tuzo Wilson, Dan McKenzie and Jason Morgan merrily explained earthquakes, volcanoes, mountain-building, and even the varying depth of the ocean, simply by the drift of fragments of the lithosphere in various directions around the globe. In Svensmark’s new paper an equally concise theory, that cosmic rays from exploded stars cool the world by increasing the cloud cover, leads to amazing explanations, not least for why evolution sometimes was rampant and sometimes faltered. In both senses of the word, this is a stellar revision of the story of life. The long-term diversity of life in the sea depends on the sea-level set by plate tectonics and the local supernova rate set by the astrophysics, and on virtually nothing else. The long-term primary productivity of life in the sea – the net growth of photosynthetic microbes – depends on the supernova rate, and on virtually nothing else. Exceptionally close supernovae account for short-lived falls in sea-level during the past 500 million years, long-known to geophysicists but never convincingly explained..
As the geological and astronomical records converge, the match between climate and supernova rates gets better and better, with high rates bringing icy times. Presented with due caution as well as with consideration for the feelings of experts in several fields of research, a story unfolds in which everything meshes like well-made clockwork. 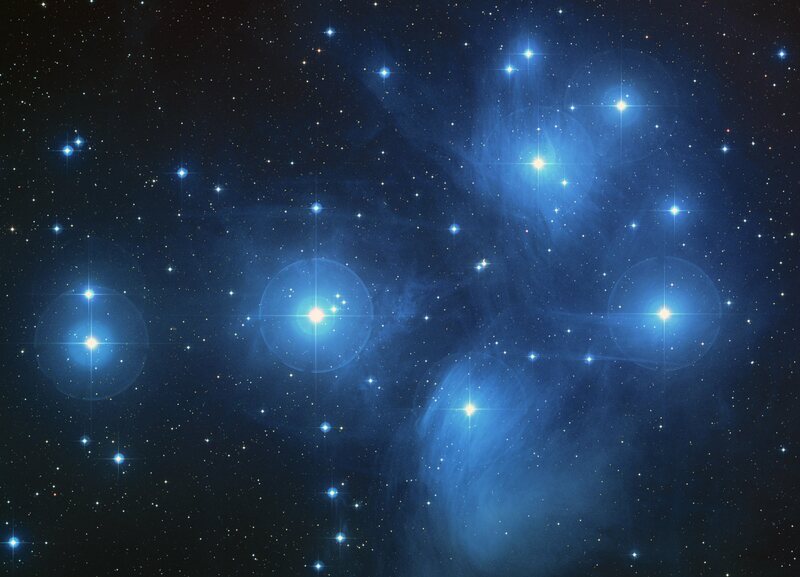 Anyone who wishes to pooh-pooh any piece of it by saying “correlation is not necessarily causality” should offer some other mega-theory that says why several mutually supportive coincidences arise between events in our galactic neighbourhood and living conditions on the Earth. An amusing point is that Svensmark stands the currently popular carbon dioxide story on its head. Some geoscientists want to blame the drastic alternations of hot and icy conditions during the past 500 million years on increases and decreases in carbon dioxide, which they explain in intricate ways. For Svensmark, the changes driven by the stars govern the amount of carbon dioxide in the air. Climate and life control CO2, not the other way around. By implication, supernovae also determine the amount of oxygen available for animals like you and me to breathe. 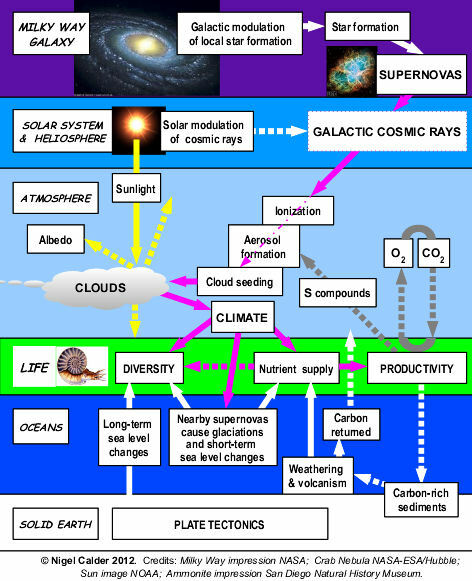 So the inherently simple cosmic-ray/cloud hypothesis now has far-reaching consequences, which I’ve tried to sum up in this diagram. Cosmic rays in action. The main findings in the new Svensmark paper concern the uppermost stellar band, the green band of living things and, on the right, atmospheric chemistry. Although solar modulation of galactic cosmic rays is important to us on short timescales, its effects are smaller and briefer than the major long-term changes controlled by the rate of formation of big stars in our vicinity, and their self-destruction as supernovae. Although copyrighted, this figure may be reproduced with due acknowledgement in the context of Henrik Svensmark's work. The text of “Evidence of nearby supernovae affecting life on Earth” is available via ftp://ftp2.space.dtu.dk/pub/Svensmark/MNRAS_Svensmark2012.pdf The paper is highly technical, as befits a professional journal, so to non-expert eyes even the illustrations may be a little puzzling. So I’ve enlisted the aid of Liz Calder to explain the way one of the most striking graphs, Svensmark’s Figure 20, was put together. That graph shows how, over the past 440 million years, the changing rates of supernova explosions relatively close to the Earth have strongly influenced the biodiversity of marine invertebrate animals, from trilobites of ancient times to lobsters of today. Svensmark’s published caption ends: “Evidently marine biodiversity is largely explained by a combination of sea-level and astrophysical activity.” To follow his argument you need to see how Figure 20 draws on information in Figure 19. That tells of the total diversity of the sea creatures in the fossil record, fluctuating between times of rapid evolution and times of recession. The count is by genera, which are groups of similar animals. Here it’s shown freehand by Liz in Sketch A. 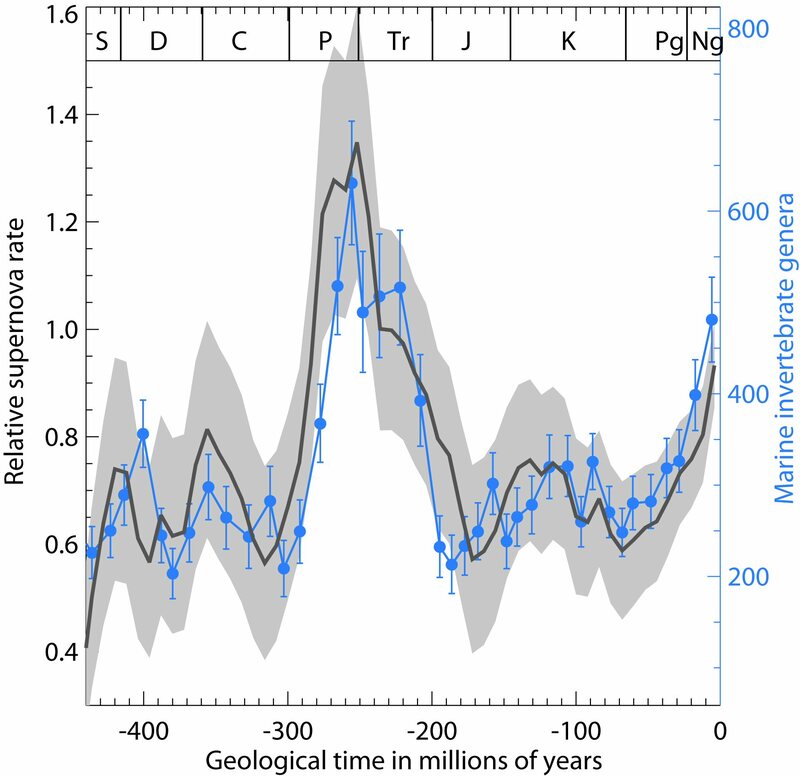 Sketch B is from another part of Figure 19, telling how the long-term global sea-level changed during the same period. The broad correspondence isn’t surprising because a high sea-level floods continental margins and gives the marine invertebrates more extensive and varied habitats. But it obviously isn’t the whole story. For a start, there’s a conspicuous spike in diversity about 270 million years ago that contradicts the declining sea-level. Svensmark knew that there was a strong peak in the supernova rate around that time. So he looked to see what would happen to the wiggles over the whole 440 million years if he “normalized” the biodiversity to remove the influence of sea-level. That simple operation is shown in Sketch C, where the 270-million-year spike becomes broader and taller. Sketch D shows Svensmark’s reckoning of the changing rates of nearby supernovae during the same period. Let me stress that these are all freehand sketches to explain the operations, not to convey the data. In the published paper, the graphs as in C and D are drawn precisely and superimposed for comparison. This is Svensmark's Figure 20, with axes re-labelled with simpler words for the RAS press release. Biodiversity (the normalized marine invertebrate genera count) is in blue, with vertical bars indicating possible errors. The supernova rates are in black. There are many fascinating particulars that I might use to illustrate the significance of Svensmark’s findings. To choose the Gorgon’s story that follows is not entirely arbitrary, because this brings in another of those top results, about supernovae and bio-productivity. Luckiest among our ancestors was a mammal-like reptile, or therapsid, that scraped through the Permo-Triassic Event, the worst catastrophe in the history of animal life. The climax was 251 million years ago at the end of the Permian Period. Nearly all animal species in the sea went extinct, along with most on land. The event ended the era of “old life”, the Palaeozoic, and ushered in the Mesozoic Era, when our ancestors would become small mammals trying to keep clear of the dinosaurs. 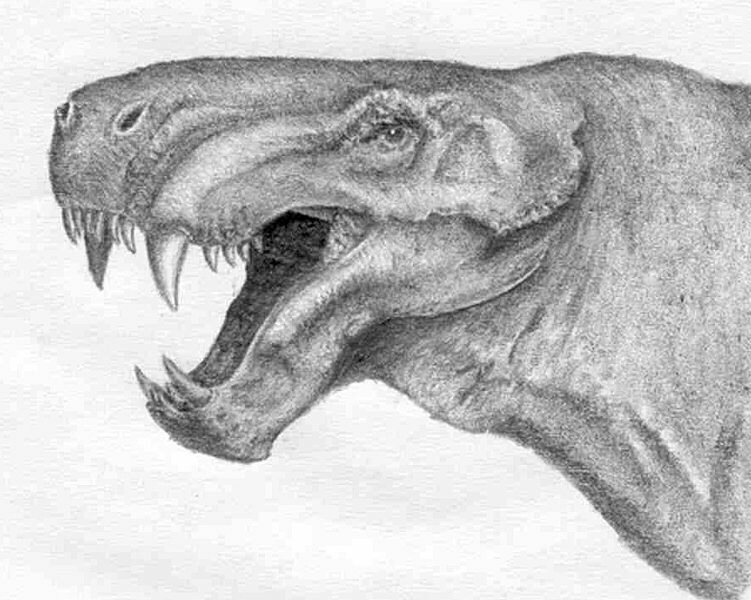 So what put to death our previously flourishing Gorgon-faced cousins of the Late Permian? According to Henrik Svensmark, the Galaxy let the reptiles down. Forget old suggestions (by myself included) that the impact of a comet or asteroid was to blame, like the one that did for the dinosaurs at the end of the Mesozoic. The greatest dying was less sudden than that. Similarly the impressive evidence for an eruption 250 million years ago – a flood basalt event that smothered Siberia with noxious volcanic rocks covering an area half the size of Australia – tells of only a belated regional coup de grâce. It’s more to the point that oxygen was in short supply – geologists speak of a “superanoxic ocean”. And there was far more carbon dioxide in the air than there is now. “Well there you go,” some people will say. “We told you CO2 is bad for you.” That, of course, overlooks the fact that the notorious gas keeps us alive. The recently increased CO2 shares with the plant breeders the credit for feeding the growing human population. Plants and photosynthetic microbes covet CO2 to grow. 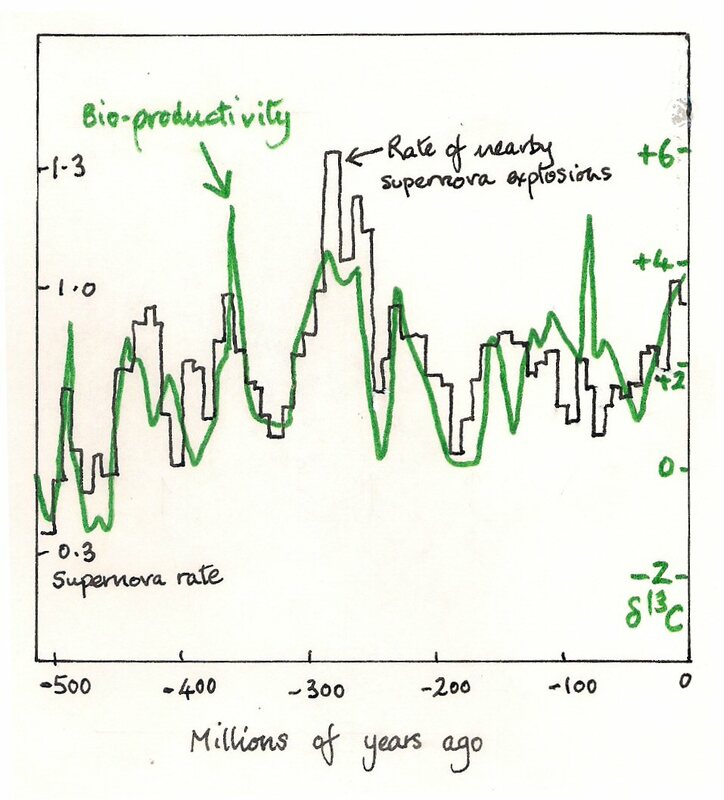 So in the late Permian its high concentration was a symptom of a big shortfall in life’s productivity, due to few supernovae, ice-free conditions, and a lack of weather to circulate the nutrients. And as photosynthesis is also badly needed to turn H2O into O2, the doomed animals were left gasping for oxygen, with little more than half of what we’re lucky to breathe today. One size doesn’t fit all, and a fuller story of Late Permian biodiversity becomes subtler and even more persuasive. About 6 million years before the culminating mass extinction of 251 million years ago, a lesser one occurred at the end of the Guadalupian stage. This earlier extinction was linked with a brief resurgence in the supernova rate and a global cooling that interrupted the mid-Permian warming. In contrast with the end of the Permian, bio-productivity was high. The chief victims of this die-off were warm-water creatures including gigantic bivalves and rugose corals. So what, you may wonder, is the most life-enhancing supernova rate? Without wanting to sound like Voltaire’s Dr Pangloss, it’s probably not very far from the average rate for the past few hundred million years, nor very different from what we have now. Biodiversity and bio-productivity are both generous at present. Svensmark has commented (not in the paper itself) on a closely related question – where’s the best place to live in the Galaxy? If this blog has sometimes seemed too cocky about the Svensmark hypothesis, it’s because I’ve known what was in the pipeline, from theories, observations and experiments, long before publication. Since 1996 the hypothesis has brought new successes year by year and has resisted umpteen attempts to falsify it. New additions at the level of microphysics include a previously unknown reaction of sulphuric acid, as in a recent preprint. On a vastly different scale, Svensmark’s present supernova paper gives us better knowledge of the shape of the Milky Way Galaxy. A mark of a good hypothesis is that it looks better and better as time passes. With the triumph of plate tectonics, diehard opponents were left redfaced and blustering. In 1960 you’d not get a job in an American geology department if you believed in continental drift, but by 1970 you’d not get the job if you didn’t. That’s what a paradigm shift means in practice and it will happen sometime soon with cosmic rays in climate physics. Plate tectonics was never much of a political issue, except in the Communist bloc. There, the immobility of continents was doctrinally imposed by the Soviet Academy of Sciences. An analagous diehard doctrine in climate physics went global two decades ago, when the Intergovernmental Panel on Climate Change was conceived to insist that natural causes of climate change are minor compared with human impacts. Don’t fret about the diehards. The glory of empirical science is this: no matter how many years, decades, or sometimes centuries it may take, in the end the story will come out right. When speculating four decades ago about the military uses of geophysics, Gordon J.F. MacDonald of UCLA contemplated the triggering of earthquakes or tsunamis, or melting polar ice with nuclear weapons. And he didn’t overlook the idea of steering hurricanes to ravage the enemy’s coasts. Reminding me of that prediction is a report now in press in Geophysical Research Letters, about how natural variations in the colour of the sea help to guide cyclones in the Pacific. A cyclone, remember, is a loosely used generic term that includes the major storms called hurricanes (Atlantic), typhoons (Pacific) or tropical cyclones (Indian Ocean and Australia). … preliminary experiments have been carried out on the seeding of hurricanes. The dynamics of hurricanes and the mechanism by which energy is transferred from the ocean into the atmosphere supporting the hurricane are poorly understood. Yet various schemes for both dissipation and steering can be imagined. Although hurricanes originate in tropical regions, they can travel into temperate latitudes, as the residents of New England know only too well. A controlled hurricane could be used as a weapon to terrorize opponents over substantial parts of the populated world.